The Whirly Board is not as hard to use as it looks, but it is harder than most of the other balance boards that we’ve tested. Working at a standing desk on the Whirly Board is fun, and it encourages a lot of leg movement without being a major distraction. While it’s not for everyone, it has enough positive qualities that it could end up being a major industry player. 32" x 8" x 4"
One of the most fun balance boards we’ve tested due to its overall design. Encourages frequent leg movement while balancing. Despite its look, does not prevent one from working productively at a standing desk. Reasonably priced with a lifetime warranty. Requires a bit of a learning curve, especially for people new to balance boards. 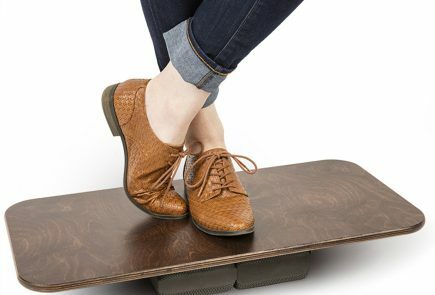 The Whirly Board is perfect for people who are already familiar with balance boards, and still pretty good for everyone else. It will definitely help you get more out of your standing desk, but expect to put in a day or two of learning time before you feel comfortable. A modest price, lifetime warranty, and available customization options are all icing on the cake. The Whirly Board is a product that grows on you. Sure, we were skeptical at first of what appeared to be an unforgivingly steep center balancing point—it simply did not look like a product that you’d be able to use while getting real work done, let alone in an office environment. But after only a day or two of use, the appeal of the Whirly Board became clear. It provides a lot of lower body movement without actually inhibiting one’s ability to work at a standing desk—it was surprisingly easy to stay balanced on. Granted, it’s not for everyone, and it’s not something you can expect to stand all day on (which you shouldn’t be doing anyway), but for the right person, it can be a part of an active workday without giving up much of anything in terms of concentration and productivity. Available with a fish graphic- because why not? The Whirly Board is sized like, and clearly modeled after, a skateboard. The top surface is coated with a rough, sandpapery layer called grip tape that gives you tons of traction and prevents your feet from slipping—this is basically the best and safest coating available for balance boards (you’ll want to make sure to use this one with shoes on). Each end of the board is angled upward. While this doesn’t seem like an important feature, it is nice to stand with your feet asymmetrically as you fidget with the board from time to time, with one foot on an end and the other in the center. The deck is available in plain wood grain, a mountain print, a selection of fish prints, with other limited-time prints also available. The center ball color is also customizable. Bulk orders are eligible for custom prints, including company logos, as well. On the underside of the board, you’ll find the large center ball and two smaller side balls. The side balls function mostly as “stoppers”, so your board doesn’t act like a complete see-saw, and it actually feels pretty forgiving to go from side to side on the board. You can also balance on the side balls by placing one foot in the center of the board and the other foot at the end of the board, though this requires a bit too much concentration to do regularly while working. Rocking your feet front to back gives you a deeper stretch (since you’re using the whole center ball without the side balls interfering) and isn’t recommended until you get pretty comfortable with the board. If this all sounds complicated, it’s really not. Using the board feels intuitive and we want to stress that it looks and sounds more challenging than it is. Plant your hands on your desk or keyboard to steady yourself, and you should feel stable on top of the Whirly Board. It may not be for everyone, but it certainly can suit a wider audience than just those proficient with a skateboard. The anatomy of a Whirly Board. Because the Whirly Board gives you so much more movement than other balance boards, it tends to tire you out more quickly. If you stand for half of your work day (let’s say four hours), you’ll probably only want to use the Whirly Board for one or two hours, and you’ll want to break that up into two chunks if it’s closer to two. This is a good thing overall—it’s clear that you’re burning calories passively while using this product. Just don’t let it cut your standing time short—you can always switch to a standing mat and give your feet a rest. And again, if you’re worried that you won’t be able to type or concentrate while on the Whirly Board, our experience was that it did not impede our ability to concentrate after we got familiar with the product. (It should go without saying, but this review was written while on the Whirly Board). With hands on a keyboard (tray), balancing becomes effortless. There are two major factors that make the Whirly Board easier to use than it looks. The first is the fact that, when you’re at your standing desk, you’re using your hands to anchor yourself as you type, and the board is stable enough that you can do this without thinking about it. Balancing on the board away from a desk is more challenging, but at your desk, it’s incredibly easy. The second factor is that due to the board’s two smaller side balls, the intimidating size of the center ball doesn’t really come into play unless you’re tilting backwards or forwards. So as long as you stick to side-to-side movement while you’re starting out, you shouldn’t experience much disruption to your work flow. (And it’s not like you’ll fall if you tilt forwards or backwards, but if you tilt you far, you can expect an intense ankle stretch). We’ve been following the balance board trend for over a year now, and we’ve seen everything from incredibly easy to super challenging boards. As you spend more time on a balance board, you get more used to it, and you build up your tolerance. It makes it hard to go back to less challenging boards—and truthfully, the Whirly Board makes it tough to enjoy a lot of the other boards that we’ve reviewed highly. However, its higher payoff comes with a higher difficulty curve. While you can choose the Whirly Board as your first balance board, it also wouldn’t be a bad idea to start with an easier board like the Pono or Vew-do Zone. We wouldn’t recommend the Whirly Board for people with particularly bad balance, or those with health problems who aren’t able to adjust their positioning quickly and painlessly. It’s a product that can help healthy workers stay healthy. The Whirly Board starts at $119, which is a seriously reasonable price considering the quality of the product. It’s made of real maple and real grip tape. Because it doesn’t purport to be a magical health solution to any of your knee or leg problems, the price isn’t unreasonably jacked up. However, after several weeks of use, we did notice that the center ball on the bottom stopped balancing perfectly (it’s only really noticeable when the board is not in use). With continued wear, will the plastic of the ball eventually become uneven? We don’t know for sure, but the good news is that the Whirly Board does come with a lifetime warranty, so if anything goes wrong, it should be covered. While the Whirly Board probably won’t be sweeping corporate offices across the nation due to its skateboard-inspired design (it’s probably more at home at startups or forward-thinking tech companies), that doesn’t mean it’s a bad product. In fact, it’s a really good one that rewards anyone willing to put in the time to learn how to use it. If you’re already a fan of balance boards, you’ll dig the Whirly Board. If you’re a regular standing desk user looking to burn a few extra calories, well, there are a lot of balance boards that can do that. Most of them are easier to learn than the Whirly Board, but none of them provide quite as much passive movement, and none of them are as fun. For more information on balance boards, check out our balance board comparison review.